My Ollie Dog Food Review: They Say They Keep It Real, Let's Find Out. For most people, their idea of dog food is not real food. Instead, it involves pebble-sized pieces of hard kibble or cans of mush. While these options may keep our dogs’ bellies full and their bodies going, they are not much of a substitute for real food. Interested in giving real dog food a try? However, real food, including raw food, is difficult to deal with in a lot of ways: time, effort, space, food safety, and more. A real food subscription service like My Ollie removes many of these barriers to feeding your dog better. Even though they are quite a few My Ollie dog food reviews already posted on quite few pet blogs, ours is designed to give you a quick look at the product, the ordering process, and the pros and cons of this choice. Ollie sources their meats from the U.S. and Australia. Actually, all of their meat products come from the U.S., except some of the lamb. All of their ingredients are human-grade and assembled in a human-grade kitchen in Pennsylvania. All of the recipes were created in consultation with a veterinarian skilled in nutrition, and are designed to meet all of your dog’s nutritional needs. They really take their dog food ingredients seriously. There are four recipes of Ollie dog food, based on beef, turkey, lamb, and chicken. 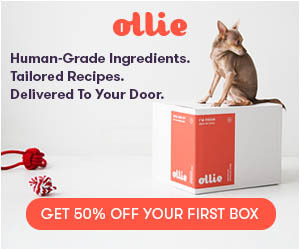 Unlike other fresh homemade dog foods, Ollie does not use a proprietary blend of nutrients, which means that the vitamins and supplements are on the ingredients list individually. All four of their foods meet AAFCO standards for All Life Stages, which means that they are suitable for any dog of any age, breed, or size. When we went to sign up for Ollie, there was quite a bit of information required. Some of it was very standard, such as name, email, etc. It asked for our zipcode, but since shipping is free, it is not quite clear what this was for. Maybe to ensure that we were within the delivery area? As the delivery area includes the entire continental U.S., it seems unlikely that many people who are ineligible attempt to sign up, but there must be some reason. This is a comprehensive list designed to feed into the algorithm that does the determinations about how much My Ollie dog food a dog needs. Presumably, it would eliminate any diet that contained an allergen source. However, Casey’s only food allergies are to pork and some grains, none of which are present in any of Ollie’s four recipes. Ollie has an interesting option to choose to feed only Ollie or some Ollie and some other type of food as a mixer. For Casey, the All-Ollie plan is delivered 28 meals at a time, every 2 weeks, and the Some-Ollie plan is delivered 14 meals at a time, every 4 weeks. The Some-Ollie plan only works out to about a quarter of your dog’s diet being Ollie, assuming the meals are split evenly. If you select the Some-Ollie plan, the cost per meal goes up (from $2.58 to $3.00 per meal for the beef variety), but the total cost of course goes down. Fourteen meals of beef-recipe Ollie delivered every four weeks will run you $42, instead of $144.58 for all 56 meals. Interestingly, when we gave Casey a 50-lb fictional canine sibling, the ordering system offered three different plans, each delivered every 2 weeks. It had the All-Ollie plan, but there was a new Mostly-Ollie plan, which had 14 meals every 2 weeks. The Some-Ollie plan was still an option, but it was now delivered as 7 meals every 2 weeks, instead of 14 meals every 4 weeks. Presumably, this is because we were ordering for a bigger dog and the food would take more space in the refrigerator or freezer, although this was not stated. So do they keep it real? You betcha. There are not a lot of options for feeding your dog fresh cooked food. If you do not have the time to cook for your dog, which most of us don’t, fresh food is probably not an option without the help of a subscription plan. As you can tell from this My Ollie dog food review piece, they are a solid choice for people who want to get away from processed dog ‘food’ but are short on time. It is also a good choice for people who would otherwise choose raw feeding but cannot have raw food in the house, do not have space for it, or just don’t want to deal with it. So if it’s something you want to try for yourself, you can use this link and get 50% off your first box order. I give it two thumbs up.